We all know that it’s important to take care of the environment around us. Solar photovoltaic installers—or PV installers, as they’re otherwise known—do just that. PV installers are at the forefront of renewable energy solutions as businesses and homeowners strive to consume responsibly. PV installers set up and maintain solar panels. They do specialized work connecting PV, or solar panels, to the power grid, in addition to activating and testing solar-powered systems for quality performance. If you are interested in a career that is technical and labor-intensive, and that also makes a positive impact on the environment, this may be the career for you. Through their work, PV installers provide environmentally-conscious energy that will last for years to come. PV installers need to be very skilled with their hands, have good balance, and pay close attention to detail. They must be able to lift heavy equipment, parts, and tools. 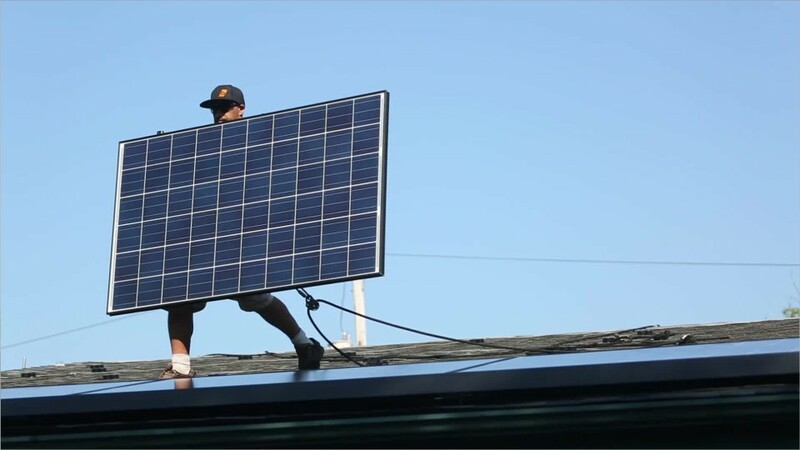 PV installers do most of their work outdoors, often on rooftops. This means that PV installers do face the risk of falling from ladders and roofs, and need to take care to avoid electrical shocks and burns from hot equipment. Training to enter the field lasts from a few days to a few months, and is available at community colleges and trade schools. Candidates with electrician or construction experience are often considered qualified to enter this career with only on-the-job training. Solar Photovoltaic Installers by U.S. Department of Labor, Employment and Training Administration is licensed under a Creative Commons Attribution 4.0 International License.